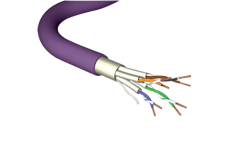 The Brand-Rex Cat6Plus cables exceed the Category E performance standards. They are rated to 250MHz and are suitable for use in all Class E structured wiring cable systems. The applications supported include Gigabit Ethernet, PoE and PoE+ and broadband video transmissions at frequencies as high as 250MHz. Included in the Leviton and Brand-Rex 25 Year System Warranties when used in conjunction with Leviton or BrandRex copper connectivity. System warranties available for qualified projects installed by certified contractors. All Rights Reserved by Metronet.